iTunes HD: is it or isn't it? Plus: SD Included! We greeted the arrival of HD TV shows for iTunes with as much joy as we greeted the return of the previously nixed NBC content: with great joy. Part of our joy was a secret hope that since the iPhone can (technically) handle HD content natively, it meant we might someday be able to play HD video direct from the iPhone -- albeit through a dreamy-future-video-out capability since playing HD on the iPhone's screen seems a little pointless. 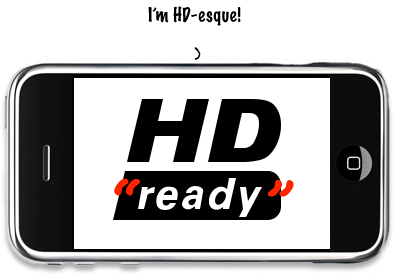 Sure, HD takes up radically more space, but hey, we like options. Well Gizmodo [via] threw some cold water on all that by pointing out that the HD iTunes streams up might not be all that HD. The issue is roughly that not all HD is created equal -- you need to check the resolution (720p or 1080i or whatnot), but you also need to give some thought to the bitrate. It's basically a function of compression and, well, the more you compress the worse it's going to look. So while iTunes is offering up HD content, that content is compressed into a size that's reasonable for most people to download. AppleInsider points out that Apple's h.264 encoding is better than most at getting quality video into a compact package. Still, don't expect your iTunes HD to look like BluRay. One nice tidbit: When you download HD content from iTunes, it includes a Standard-Def version, which is what gets transferred to your iPhone. Apple probably took a look at the 'options' we mentioned we liked and figured we were better off with the SD on our portables. We tend to agree.